As blogs continue to mature as marketing tools, there are an increasing number of “blog optimization” articles and posts appearing. However, many of these resources underestimate the importance of inbound links. Aaron Wall took some cool photos at the Boston Pubcon. Yeah, I remember back in the day when I was skinny too. I was not, however, anywhere near as smart as this young man. I’ve got a strange look on my face after hearing about some of Bill’s SEO projects. “Wow” is the word. OK, this is the LAST time I will post on the Boston Pubcon. But you know, Vegas is coming up pretty soon! Google has started promoting Firefox on its homepage. 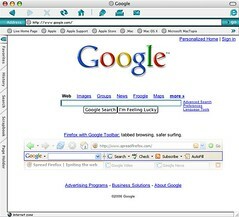 If you are running IE, head over to Google.com and you should see an ad that says “Firefox with Google Toolbar: tabbed browsing, safer surfing” with an image of the Google toolbar in Firefox under that. The bond between Google and Firefox seems to be getting stronger. This can only mean great things for the browser on all platforms in the future. So, what does Google do with toolbar data? ClickTracks has jumped on board with free stats. ClickTracks Appetizer gives you several of the popular ClickTracks features. Just enough to make you want to buy more, or so they think. Included is all the general stats information like top keywords and referrers plus a few popular features. Visitor Labeling – Through a simple mechanism known as visitor labeling, you can color-code visitors from a PPC campaign; visitors who found each page through a certain keyword; visitors who spent a very long or very short time on a page; and much more. Visual Interface – See where visitors go, how long they stay and from which page they exit. This is superimposed over your site so you can see exactly where people are going. I’ve managed to get myself into another interesting speaking situation. Last week it was both Pubcon and Bulldog Reporter. This week it’s a chat over at “Conversations with Experts”, with Patsi Krakoff and Denise Wakemen of Build a Better Blog System. I’ll be talking about search engine optimization for small and medium businesses with some blogs and press release optimization thrown in for good measure. Gone are the days of optimizing web sites through a sprinkling of keywords and submissions to the search engines. Today’s savvy marketer integrates a mix of tactics to gain the credibility and authority necessary for dominant search engine rankings. At last week’s WebmasterWorld Pubcon conference in Boston, I had the opportunity to talk to Matt Cutts from Google a few times and when I posted my recollection of comments about Google and user or toolbar data for rankings he wanted to clarify. That presented an opportunity for a mini interview about Google’s position on toolbar data. 1. Does Google currently use toolbar data for rankings? 2. What do you see as the pros and cons of using such data for rankings? 3. Can you describe any scenario where information from a downloaded application from Google might be used in some way for ranking web pages? 4. If Google does not employ toolbar or other user data for rankings and another search engine does, could that provide the other search engine an advantage? This year’s Pubcon in Boston was held at the Elephant in the Castle, a good sized Boston bar/pub. 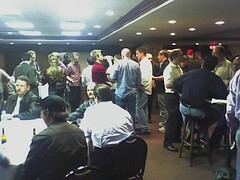 Starting out in the lower level, the WebmasterWorld crowd eventually took over the main bar as well. If forgot my conference badge but Brett Tabke was in the doorway greeting conference goers and giving out (lots of) drink tickets so getting in was no problem. There was plenty of networking with a little food/drink here and there. I think I need to upgrade to a phone with a better camera or just start bringing a camera to conferences so I can take more/better quality photos. 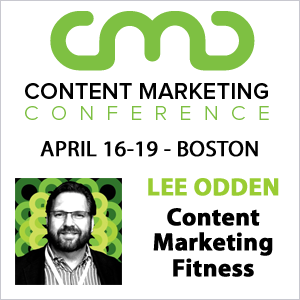 Lots of great sessions on Wednesday here at WebmasterWorld Boston Pubcon. Unfortunatley, I was only able to attend two of them (one as a speaker) due to a teleconference I did with Bulldog Reporter. I thought the Public Relations panel in the morning went well. Robin, Lawrence and David all made strong presentations. What I liked best about the session and this is corroborated by feedback I received from attendees, was the diversity of perspectives offered. Lawrence Coburn offered a small company’s inside perspective of what he called “dumb luck PR” and how to take advantage of that and snowball it. Very cool story actually. Television personality and CNN maven 🙂 Robin Liss shared her perspective on getting TV coverage. David McInnis gave a rundown on press release optimization and some of the new features available at PRWeb. My presentation covered the notion of applying search engine optimization principles to blog and press release optimization. I’ve got to fly to another Pubcon session, but wanted to quickly post on Loren Baker’s (Search Engine Journal) new web directory project, Umdum.com. John Scott has more details and there’s also an Umdum blog. Yahoo threw an invite party at “Saint” in Boston last night and it proved to be a good time. It was a good thing they were letting in “guests” of people on the list or I think there would have been only half as many people there. Good for you Yahoo in doing this as Microsoft has really shot itself in the foot at SES conferences by being uber strict with their “invite only” events. Pubcon Boston Keynote Malcolm Gladwell, Author “Tipping Point” and “Blink”. Due to the odd room layout and audio situation, I had difficulty hearing everything Malcolm had to say – even in the front row. My bad for sitting where I did, but it was a great presentation all the same. Certainly one that has motivated me to finish “The Tipping Point” and to start on “Blink”. Indeed it was another good keynote speaker choice by Brett Tabke. Gladwell took the stage and has that same funky ‘fro you see in his photos. He recently launched his blog if you want an ongoing dose of his perspective. Through story after story, he related the concepts of “connectors” and “mavens” as well as the notion of “tipping point” and how people let the perception that you always need a big solution to solve big problems. A new V7n Search Marketing News blog launched recently adding another source of news on everything to do with the search engine industry. The blog is edited by Mr. Search Engine Blog himself, Peter Da Vanzo. Expect nothing but good things from this blog as Peter and the upcoming line up of contributors will be sure to provide another perspective on the goings on in search marketing. A blog like this can be a real time-saver if you don’t have time to ready all the email newsletters and articles on search marketing.